When I was growing up, there was no “Natural Horseman” training for a young horse. The training came from one of two methods – the quick “breaking” the horse and the slower “gentling” the horse. All my horses have been bomb-proofed. Now that is a Godly statement! If my horses are bomb-proof, then why do they jump when something unexpected happens? For example, I tossed the hay net a few feet in the air to blow the excess blades of hay out. When the net went above my shoulders, Frilly, who was standing maybe six feet away eating her meal, jumped and ran off. The other two, Willow and Dream, were standing as close or closer, munching down, and they calmly watched as Frilly spiked off. I fed the three horses all winter, for two winters, with that hay net. So what set my young mare off? I tossed the net up, sure but not up so high that it went near her. I took the net into the paddock and I followed my Frilly around. I was more to her side then behind her, because I was closer to the center of the 40-foot paddock. I’d toss the net up in the air, not too high to freak her out but just enough that she would see it was loose in my hands. We did that for about five minutes, then she returned to the meal she had left. The others would eat her share and she knew it. I followed her to the other horses and the hay and once again I tossed the net. Once again Frilly moved away, but she was doing so much slower and not going nearly so far. When she returned to the hay, again I tossed the net. She stayed in place watching me and munching on the few sprigs of hay that she quickly captured. I tossed the net on her back. She didn’t move, so I tossed it over her head. She dropped her head some, so I draped it over her ears, eyes, nose…, her entire head and left it there a few seconds. That was easy! But I got to thinking, there is no possible way that I’m am going to be able to de-sensitize my horses to every thing there is that they will come across in their lives. There is just too many new things! ‘Sacking out’ and ‘de-sensitization’ wasn’t going to be enough. I need my horses overcoming that which startles them, problem solving and deciding the best way it is to confront that which they see as a problem and calculating that it won’t hurt them…, then getting on with what is expected of them. So the next step will be to create different types of problems and situations where they will have to learn to overcome their fears, in order to accomplish a certain task, that THEY want to complete. The term “Sacking out” comes from when people would tie feed sacks to the backs of their horses and allow their horses to take flight, fearfully trying to run away or kick this noisy thing off themselves. It seems to me that is rather extreme and although it probably accomplishes the lesson more quickly, it could potentially put the horse in a lot of danger. I have time and I won’t be “Sacking out” my horses. The term “de-sensitization” seems some what more humane then sacking out but I want my horses sensitive to me and their surroundings. I want them to use their natural, instinctive, maternal attitude, where they will do what it takes to keep their people (children) safe. I don’t want them walking into danger. I want they fully aware that there is danger out there and flight is not necessarily the right option to take. I want my horses to make the right choice while considering their charges on their backs. There will be more posts on this topic as I continue to work with the “beasties”, showing them that the bird flying up out of the ditch and hitting them is not a reason to take flight, but instead it is a reason to learn something new. How many horses does it take to change a light bulb? Thoroughbred: Who ME?? Do WHAT? I’m scared of light bulbs! I’m outta here! Arabian: I changed it an hour ago. C’mon you guys – catch up! Quarter Horse: Put all the bulbs in a round pen and tell me which one you want. Standardbred: Oh for Pete’s Sake, give me the darn bulb and let’s be done with it. Shetland Pony: Give it to me. I’ll kill it and we won’t have to worry about it anymore. Friesian: I would, but I can’t see where I’m going from behind all this mane. Belgian: Put the Shetland on my back, maybe he can reach it then. Warmblood: Is the 2nd Level Instruction Packet in English?Doesn’t anyone realize that I was sold for $75K as a yearling, but only because my hocks are bad, otherwise I would be worth $100K? I am NOTchanging light bulb. Make the TB get back here and do it. Morgan: Me! Me! Me! Pleeease let me! I wanna do it! I’m gonna do it! I know how, really I do! Just watch! I’ll rewire the barn after,too. Appaloosa: Ya’ll are a bunch of losers. We don’t need to change the light bulb, I ain’t scared of the dark. And someone make that darn Morgan stop jumping up and down before I double barrel him. Haflinger: That thing I ate was a light bulb? Mustang: Light bulb? Let’s go on a trail ride, instead. And camp. Out in the open like REAL horses. Lipizzaner: Hah, amateurs. I will change the light bulb. Not only that, but I will do it while standing on my hind legs and balancing it on my nose, after which I will perform seven flying lead changes in a row and a capriole. Can you do that? Huh? Huh? Didn’t think so. Miniature: I bet you think I can’t do it just cause I’m small. You know what that is? It’s sizeism! Akhal Teke: I will only change it if it’s my owner’s light bulb and no one else has ever touched it. Andalusian: I will delegate the changing of the light bulb to my personal groom after he finishes shampooing my mane and cleaning my saddle, but only on the condition that it is changed for a soft blue or green bulb, which reflects better off my coat while I exhibit my astonishing gaits. Cleveland Bay: I’m busy. Make the whipper-in and the hounds do it. Saddlebred: My ears are up already, please, please get the light bulb away from me! I’m ready to show, really, I promise I’ll win! Paint: Put all the light bulbs in a pen, tell me which one you want, and my owner will bet you twenty bucks I can get it before the quarter horse. POA: I’m not changing it. I’m the one who kicked the old one and broke it in the first place, remember? Now, excuse me, I have a grain room to break into. Grade Horse: Guys? Um, guys? I hope you don’t mind, but I went ahead and changed it while you were all arguing. Brood Mare: Oh my god, it’s light in here, it’s supposed to be dark at this time in December, darn, now I’m in heat again. City Carriage Horse: I’ll do it. For $35.00 per half hour. Plus tip. The bulb-changing starts from the minute I leave my stall to do it, until I get back to my stall. Travel Time, you understand! It is not often that a person considers an Appaloosa Sport Horse for a particular job. This was the case for Troubadour, a wonderful, rather small, grey gelding with faint marks over his back. Trouby is what is known as a “Snowflake” Appaloosa, or a dark horse with white spots over his body. Classic with his breed, Trouby’s eyes show the white sclera around the pupil, much like a human’s eyes, though in his case it is not very visible. Occasionally, and only occasionally, the all round perfect child’s horse comes available. Troubadour is such a horse. Trouby has been the spearhead of the Giddy Up Pony Camp, maintaining his position with dignity amongst the other horses. For the past eleven years, at Giddy Up Acres, he has been loved by humans, young and not so young, as well as by every horse he comes in contact with, Troubadour has made his way into the hearts of everyone who comes near him. In all his years he has never been one to display displeasure with any activity or any living creature. Troubadour had one owner before coming to Giddy Up Pony Camp, a wonderful lady, who raised him from a foal until his fourteenth year. He had a pony companion for many of those years called Lightening, whom he adored. When his mistress became ill and couldn’t look after the horses, she made the heartbreaking decision to give him away, to a good home. It was an honour to become Trouby’s care giver. This was before Giddy Up Pony Camp came into being and the ranch was know as Giddy Up Acres. 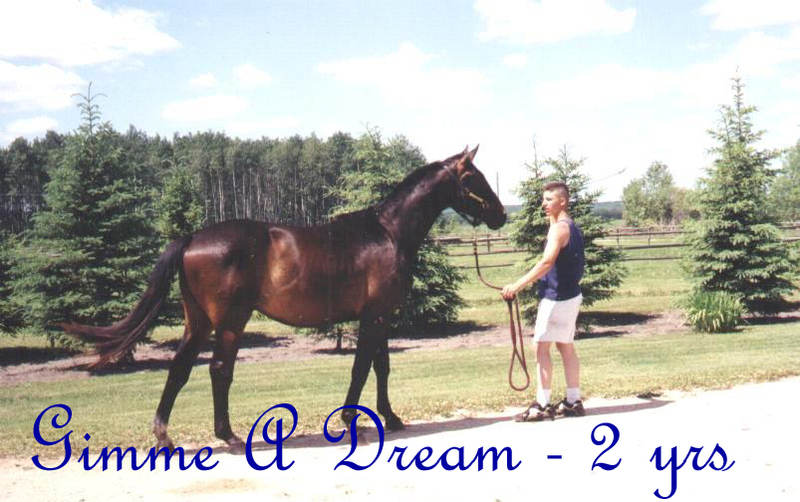 Both he and Lightening came together and enjoyed the fields with a Standardbred called Darius and a mare called Jody. It wasn’t long before Trouby began to show his abilities in the show ring. He could move into a full stretch gallop from a complete stop, in one stride. He could turn on a dime, change leads on cue and become as docile as a kitten all in the same breath. As fantastic as he is with everyone and as unusual as he is with his spots, the word Sport in Troubadour’s breed comes to mind when considering the little horse. Trouby excels at whatever task is given to him. He is a distinguished gentleman in the English Pleasure and hunter/jumper show ring, as well as a fierce competitor in the western barrel racing and pole bending circuit. A wall had been dedicated to Trouby’s activities but the awards became too many to continue displaying. Now they are carefully wrapped and stored away. As a gymkhana pony, he still brings the ribbons and trophies home for his young riders. Troubadour will be 25 years old this year. He has been retired from stressful gaming circuit, for a year now. However, Trouby continues to make his presence known to the children, who want him for their very own practice pony at the summer camp. He is so old now that his spots are almost no longer visible. However, as old as he is, Troubadour remains a real gentleman as his young charges love his gentle spirit and his willing ways. fall.” Roll lithely into a ball and spring to your feet. #7. Jog long distances carrying a halter and a carrot. Go ahead and tell the neighbors what you are doing – they might as well know now. #6. Affix a pair of reins to a moving freight train and practice pulling to a halt, smile as if you are having fun. #5. Hone your fibbing skills: “See, moving hay bales is FUN!” and, “No, really, I’m glad YOUR LUCKY performance and multimillion dollar horse won the class. I am just thankful that MY HARD WORK and actual ability won me second place”. #4. Practice dialing your chiropractor’s number with both arms paralyzed to the shoulder and one foot anchoring the lead rope of a frisky horse. #1. THE NUMBER ONE EXERCISE TO BECOME A BETTER EQUESTRIAN: Remember, it’s never the horse’s fault. If Horses were in High School, What Cliques Would They Be In? Thoroughbreds: Preppies. Sometimes athletes, never ‘jocks’. Monogrammed blankets, leather halters, Nike eventer shoes, the latest custom trailer and tack. They are the ‘new money’ rich. Shetland Ponies: Frightening, spiky hairdos, snotty attitudes and any color of the rainbow …. Gotta be PUNKS. Some even sport tattoos. Friesians: Big, buff, and always in black, they are the biker clique Cigs hanging out of the corner of their mouths, dangerous glint in the eyes, daring anyone to cross their path. Drafts (all breeds): No real clique, they’re just the big guys who sit in the back of the room and fart a lot (and then laugh). Who’s going to STOP them? Icelandics and Paso Finos: They’re the little squirrely geeks who flit around a dance trying to fit in and fail miserably. The kind who wear Toughskins jeans from Sears (or would that be rip off WeathaBeetas??). Ahkle Tekl (Akle Takl? Ackle Tackle….!! Akhal Teke!! ): Foreign exchange student(s). And no one can spell their names either. Hackney Ponies: A breed this manic would have to be a band geek. Marching along with their knees and heads held high…..even going to the bathroom. Canadians: They’re the bookworms and computer geeks of the the horse world. To Vaccinate or Not To Vaccinate! wound to fight and save his dying horse. Nobility is not a birth right but is defined by one’s action. Will I vaccinate this year? That is the statement of the day, isn’t it? This is a question many of you are now asking yourselves. These viruses are transmitted by the bite of the mosquito and can be passed through to humans. Each strain is unique to an area so that EEE is seen in Eastern North America, WEE in Western areas and Venezuelan is widespread in South America. Symptoms – include increased temperature, listlessness and loss of appetite. Initially the disease may be so mild that it isn’t noticed. As the disease progresses, the horse may show signs of irritation and nervousness, extreme listlessness, and eventually paralysis and death. Humans, donkeys, mules and horses are susceptible. Treatment – Veterinary care in the early stages is crucial. Although there is no specific treatment available, treatment of the symptoms with drug and vitamin therapies may help a horse survive the effects of the virus. Prevention – Vaccination is the best preventative for EEE, WEE, and VEE. Individuals with the disease should be quarantined and steps to reducing biting insects taken. If you live in an area where EE is prevalent call your veterinarian for the recommended vaccination schedule. Spring time has arrived on the islands. Crocuses are peeping up through the melted snow banks and muck is everywhere. Soon the grounds will be lit up with tulips and daffodils and soon after the insects arrive in fury. Actually I saw the first mosquito yesterday flying around. It must be the male mosquitoes that comes out of hibernation first because they don’t bite this time of the year. Instead, the females become the vampires of the insect world late in June or even in early July here. They are monsters for the horses, from around 9:00pm to midnight and early mornings also, sometimes. So do I vaccinate? Not this year! There has been no accounts of the eastern strain virus on the islands to date. Granted it is only a matter of time, because the strain has been noticed in Eastern Canada, but because of the isolation of my three horses, I’m estimating that the risk is minimal and I just don’t have the money for needless frivolities, this year. However, as in all years, I’ll make a special trip to the veterinarians office to get the local gossip on local contagious diseases. I try to keep myself informed. I’ll be listening to the gossip, to hear who lost what horse and why, then I’ll ask the vet what her thoughts are on the subject and determine if there is any contagions in the area. That is the least I can do without putting more pressure on the pocketbook. But I won’t be worried about infected mosquitoes this year. I’m attempting to make a natural bug control system this year. I bought eight laying hens which are now free range in the wetland area of the horses pasture and paddocks. I’m hoping that they will control some of the insects that bother the horses and humans alike. The hens are becoming very precious to me. There is one hen who enjoys her own company so much that she doesn’t return to the hen pen at night. At five in the morning, I took grain out to the hens and there she was waiting to be fed. They others were all still locked up for the night. I picked her up and hugged her tight and stroked her soft feathers. She didn’t mind! Then I returned her to the pen and dropped the grains in their dish. I leave a light on all night. It is not good for the hens since it keeps them awake, but I feel as though I have little choice. The pen is in the greenhouse and there are fox in the area. My neighbours say the fox is starving but that is not true. They all throw leftovers out for the fox and crows and I’ve seen the fox with the horses. He is not starving. However, the light serves to keep him away from the greenhouse. My newest and best project yet is this lead made of coral and turquoise baling twine. It has a brass hook that is used on sailing ships. I’ve used these hooks on lead ropes before and they don’t break very easily. Gimme A Dream is the only horse to break one and he pulled four large spruce trees out by the roots that he was cross tied to, so I could trim his hooves. The hook broke on the last tree when he ran over it, and his hooves had to wait cause the 17hh, 1400lbs monster was loose and running down the road. These ropes don’t break with the pressure that he can put on them. They are UV resistant and last in all types of weather. If I leave it on the fence post, it gets kick to the ground and spends the winter months under snow and hooves, it is going to be the same come spring. Give it a wash and go. As one of my young nieces would say, “Yewwww…,Gross me out!” This is not something anyone really enjoys thinking about, but…, unfortunately it is a fact. Does your horse need de-worming medication? Most of you who read this, know all about de-worming a horse and probably have your horses on a regular de-worming schedule. Most likely your horses need to have the medication. But not always and not all horses, strange as it may seem. In an earlier post on potatoes, I mentioned that I never once de-wormed Copper in the seven years that I had him, nor the seven years that his previous owner, my cousin, had him. Copper is a pie-bald Pinto/Tennessee Walker and now he is over in PEI and still doesn’t get de-wormed. When I took him over to Prince Edward Island, the veterinarian looked him over, tested his stools and said he didn’t need the attention. Now I’ve had Gimme A Dream slightly more than two years and I’ve de-wormed him four times. Each time, I swear that the medication didn’t work. Frilly came from the CDP (Charlottetown Driving Park) and I found out she was infested with small strongyles (small red worm) this month, almost a year after I took her from the CDP. These worms are known to kill their host and they are well known to resist de-worm medication. I didn’t have her tested because there was no need. I could see them in her stools. Frilly has been de-wormed several times since I owned her, each time with a different brand with a different active ingredient. She was de-wormed a couple of times before she came to the Magdalen Islands. Now I’m questioning where she came by them and more important, why does she still have them? I specifically checked for worms in the filly. She has had bare spots appearing in her fur around her rump, which I associated with worms. The other two horses, Gimme A Dream and Willow don’t have the same problem. Last March, Frilly lost fur in circles and I de-wormed all of the horses, as I did the other day. Last year, I targeted ringworm specifically and all other species generally. To me it is obvious that I didn’t get the small redworm last spring, because of the infestation this spring. Now I realize that most of you are thinking that she has been re-infested from grazing. I would normally consider that seriously except all of my horses are on fresh pasture land and there are no other animals on the island. Because of this lack of animals, either domestic or wild, we don’t have the insect population that creates the larva that, when ingested, cause the worm problem. For example, I don’t have the bot problem that other places have, because the island doesn’t have the bot fly. I’m thinking that Frilly brought the worms from the racetrack, the CDP. Race horse owners are notorious for cheaping out, when their investments don’t pay off. I’ve heard that the CDP is a festering maggot pile, from a few horse owners who do care a great deal for their four-legged athletes. That means that the small redworm has developed a resistance to the medication I gave them last year. I’ve come to this conclusion because of the isolation the horses live in, on this island. We have very few species of insect here. Of the insects that bother the horses there are only two, the mosquito and the horse fly. The vet says that this is normal, but it is not! They have them on her island Grindstone and also on Amherst and House Harbour islands, but not here on Coffin Island. Also we have a small amount of wormwood growing wild in the pastures. Wormwood is known to kill parasites within warm blooded bodies. It is unlikely that we have many of the other parasites that cause worms in the horses. We have mosquitos and horse flies (the vampires) of the insect world. There are a few house flies. After all is said and done, it is possible and probable that my dear deceased Sammy (Sam’s Pride) was the culprit who infected Frilly. Her stools had been tested and came out positive for some worms but not enough to suspect fowl play in her death. So what this comes down to is that, I want them gone…, before the horses go out on the pasture this summer. They won’t re-infect themselves this time of the year, but the eggs can live in the grass and whatever insect emerges will create the larva in the grass and re-infect the horses. That just won’t do! I have an intense dislike putting chemicals into the bodies of my four legged friends. If I can prevent the spread of these worms, I’m going to do it. But unfortunately, I still sense that I didn’t get them gone from young Frilly. I will be giving her a dose of something else, brain-storming with the vet and sending to the manufactures for something different. I don’t know what else I can do!